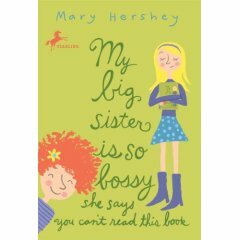 Effie Maloney tries to do the right thing, but that's hard when your older sister Maxie is always getting you in trouble. And when Maxie steals money from the Scouts fund (and pins the blame on Effie), she has to figure out a way to set things right. Add to all this mess a mother who is distant, a terrible secret or three, and a struggle to find a new best friend, and you have utter 4th grade hell all over the place (but don't say THAT around Mom if you know what's good for you!). It is a bit painful getting through the book as Effie goes through a lot of unnecessary suffering, and then the whole thing wraps up a bit too neatly at the end. But moving beyond the torturous plot, there is a bit of charm to the characters. And perhaps what is hard for an adult to read, would actually be fun for a younger reader. There's certainly an honestu and authenticity to this book that makes it charming. And I especially like the portrayal of a religious household that was neither mocking or cloying. It's a book that would please more conservative families because of its stress on morality and godliness, but at the same time Hershey's worked in some good multiculturalism as well (something for everyone! ).